Alice Stone is famous for the homemade southern cuisine she serves at Café Andres, a chic gathering place for New York’s cultural illuminati, and in her groundbreaking southern cookbook. But her past, on the other hand, is a mystery to all who know her. Upon Alice’s retirement, Bobby Banks, a young gay man ostracized by his family in Georgia, sets out to revive the aging café with his own brand of southern cooking while struggling with heartbreak like he’s never known. Meanwhile, seeking respite from the breakup of her marriage, wealthy divorcée Amelia Brighton finds solace in the company and food at Café Andres, until a family secret comes to light in the pages of Alice’s cookbook that threatens to upend her life. In her most accomplished novel yet, Susan Rebecca White braids together the stories of these three unforgettable characters who must learn that when you embrace the thing that makes you different, you finally may become whole. For fans of The Help, a tale of Southern exiles--an older black woman (based on legendary chef Edna Lewis) and a young gay man--who find each other in New York City through their love of down-home cooking." "White is convinced that coincidence doesn't exist, that we come together becasue there is a grand plan always at work. Rendering that truth so confidently and effortlessly--that is White's magic. Wanting each of us to find a place at the table--that is White's gift." 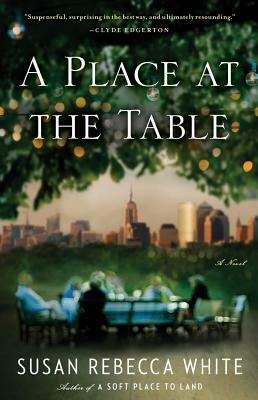 A Place at the Table is the story of troubled souls finding their way and making a place for themselves through the magic of the big city and a love of cooking. With unforgettable characters, rich detail, and seamless narration, White's new novel will long remain in the reader's mind and memory, a gentle reminder of the importance of acceptance in all it's forms and the myriad connections that surround us." "Beautifully told...White's characters are drawn with tremendous care and precision....perfectly observed." "Engaging...a story of acceptance, of finding oneself, and of healing." "No writer should be able to write smoothly and cleanly from three very different perspectives about lost love, betrayal, pound cake, fear, family ties, racism, Baptists, "the other," Episcopalians, the south, and New York. But Susan Rebecca White has--and without a false note nor a single sentimental pink bow. All this in her new and best novel yet: A Place at the Table. The story is suspenseful, surprising in the best way, and ultimately resounding. It's so good I wish I could tell you more about it. The story will bring you face to face with all sorts of demons and lovely things--and with some very real people whom you just may recognize as family." "Susan Rebecca White is a first rate talent whose work is like good bread; it rises, and it leaves us filled. A Place at the Table is a love story written for expats and orphans, for all who seek home and find it in the most beautiful, the most unlikely place. This is a glorious novel, told in a pitch perfect voice. I love this book."